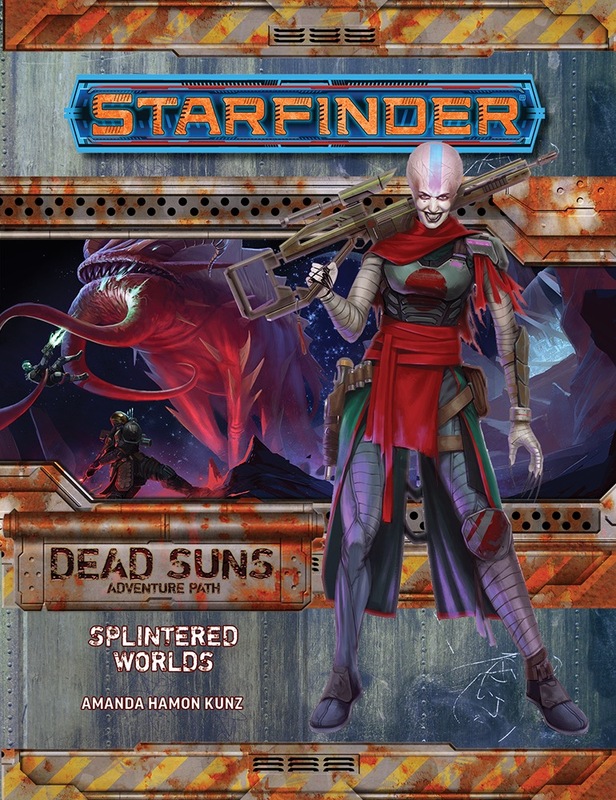 "Splintered Worlds," a Starfinder adventure for 5th-level characters, by Amanda Hamon Kunz. A gazetteer of Eox, the planet of the dead, including rules for disturbing necromantic augmentations called necrografts, by Owen K.C. Stephens. Details on the exiled Corpse Fleet, the rogue undead navy of Eox, including new necrotech armor and weapons and additional Corpse Fleet starships, by Thurston Hillman. An archive of strange new alien creatures, both living and undead, by Amanda Hamon Kunz and Owen K.C. Stephens. Statistics and deck plans for a new starship, by Amanda Hamon Kunz, plus a rogue planet that hosts a secret Corpse Fleet base in the Codex of Worlds, by Jason Keeley. 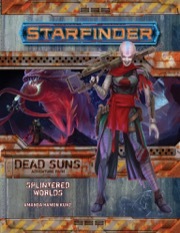 Splintered Worlds is sanctioned for use in Starfinder Society Roleplaying Guild. Over all this is a good adventure. It gives us a chance to get a lot of the flavor of both Eox and the Diaspora and it gives us some interesting fights. Its only major flaw is that at one point the primary antagonists act incredibly stupidly for no explained reason (see spoiler for details). In the second half of the adventure, the PCs have to do an investigation and the in-story reason why the investigation is so easy is that the antagonists want the PCs to succeed so they can be lured into a trap. This then leads the PCs into three really hard fights one after another. … the problem is that there is no reason given for why these fights are separate. The first fights is with an giant soul eating monster (which has no ranged attack, so it can be easily killed if any of the PCs can fly by the way) and the second fight is with a woman who keeps the monster as a pet and is in a building right next to it. She is apparently supposed to not hear the sound of combat 20 feet away and join in. If the GM does decide to have her join in, then the fight goes from hard (assuming no one has flying or a vehicle) to incredibly hard. Then the PCs have to fight the remainder of the antagonists (who didn’t join in the previous fights for no explained reason). So to review, the primary antagonists are intelligent enough to lay a trap for the PCs, but then divide their forces into three waves (for no explained reason) that the PCs can rest between fighting. A really nice chapter in the Dead Suns AP! Great NPCs, fun storyline... really enjoyed GMing it and the players loved playing it (even if they all died in the last fight!). • Like posted above, the "mind spores trap" is a bad idea. I should have changed it RP-wise to being delivered by some dart. My crew had Air Bubble on + their armor's rebreather on... and yet it magically bypasses all! While not perfect this adventure is fillled with many awesome encounters, locations, and NPCs. The back matter on Eox makes the setting really fun, and gave me many fun ideas. While I have concerns about some npc actions and encounter difficulty levels we all had a great time. This keeps it a 5/5. I really wanted to like this installment of the Dead Suns adventure path a lot. And, to the volume’s credit, the combats near the end of the book were very memorable and gave the book a pretty epic feel. However, there were enough things that either the AP didn’t cover or that seemingly went against expectations for how everything else should work in the Starfinder setting that I was constantly being pulled out of the AP to fill in gaps for, frankly, confusing or poorly thought out story development. I ended up giving this two stars because it felt like the story created a lot of world-building gaps unnecessarily and then didn’t do anything to fill them in. A lot of this is captured by user Steel_Wind’s comments in the “Splintered Worlds (GM Reference)” in the Starfinder Adventure Path / Dead Suns forum (with spoilers), too. The trip to, and activity on, the asteroid work well enough, but the asteroid itself has some problems. According to pg. 7 of the book, Asteroid K9204 “is less than a mile in diameter” but somehow “is dense enough to provide low gravity (Starfinder Core Rulebook 402) and is enveloped with a thin atmosphere (Core Rulebook 396).” Huh? I know Starfinder physics aren’t real world physics, but this seems quite a stretch from any reasonable understanding of how normal asteroids in space are supposed to work. As a player or GM playing in a “science fantasy” setting, sure we can handwave it off as “magic asteroid”, but when people envision an asteroid less than a mile in diameter they don’t (or shouldn’t) think that the asteroid will have an atmosphere. And, while I acknowledge there’s a literal river running through the Diaspora and that doesn’t make any sense either, having some sort of explanation other than “magic” aka “that’s just the way it is” for the PCs when they ask about why an asteroid is a certain way that runs counter to how “real” asteroids function practically 100% of the time. A few issues from this part. First, after descending into the Cultist’s base, the PCs encounter a mind spores trap. No big deal – the PCs should have their armor’s environmental protection up, per pg. 196 of the core rulebook, and the spores harmlessly bounce off, (Temple of the Twelve spoiler) just like they did in part II of the AP back on Castrovel (/Temple of the Twelve spoiler). Oh, but wait, (pg. 12) “Any environmental protections from a creature’s armor do nothing to avoid this trap’s effects, since it’s specifically designed to penetrate breathing apparatuses.” Huh? Going back to pg. 196 of the core rulebook, while some armor uses airtight seals, other armors create “minor force field specially attuned to pressure and temperature that does not reduce damage from attacks”. Also, given that armor is supposed to protect the wearer in areas that completely lack an atmosphere, it’s not like whatever the PC is breathing through is filtering the outside air (or lack thereof) – it seems like it should be creating a breathable atmosphere (like the spell life bubble) without having to filter anything. This is a much longer than needed explanation for effectively stating it seems like the author/editor made up a trap and ignored reasons why it wouldn’t work “because plot”. Now PCs have an in-character expectation that there armor will work against environmental hazards, except when it (seemingly arbitrarily) doesn’t, without any real explanation. And there’s an easy solution: just make it a trap (any kind of trap) that doesn’t rely on spores. Issue #2 with part II: the moving laser wall in B3 is, I believe, the first official instance of what is effectively a critical failure being included in a Paizo published Starfinder product. If the PC rolls a natural 1 on their save, not only do they fail the initial save but have to make a secondary save that, if they fail, causes them to suffer 20d6 fire damage at level 5. Once more: huh? No other trap in the (albeit short) history of Starfinder functions this way. No other trap effectively kills a PC if they roll a natural 1 on a save (and fail a follow on save) vs failing a save normally. For something like less than 5% of the PCs playing the adventure path, though, congratulations, your character is now dead because a trap functioned, frankly, like no other trap in Starfinder functions with no explanation and no reason given. This isn’t fun for the players (or for the GM to try to explain), this isn’t creative or “different. This is the type of thing I’d expect to find in a poorly edited scenario and is beneath Paizo’s usual high standard of writing/editing in official publications. knowing where the cultists fled or who exactly deleted the name of their destination…” And then, thank goodness, the Corpse Fleeting sitting in orbit attacks them so they know they’re back on the right path. While it’s challenging for the PCs to figure out the Corpse Fleet is probably behind all this from the limited clues left in the base, if it’s supposed to be hard then let it be hard. Creating a situation where the PCs are plausibly supposed to think they failed before being “rescued” by the story having the bad guys attack them or Chiskisk call in to tell them to go to Eox seems very railroad-y, and takes the feelings of success (or failure – because it wasn’t a real failure) away from the PCs because apparently their actions to determine what happened to the cultists or the data didn’t really matter. First, the good. Eox is really, really cool. Waneda Trux was one of my favorite characters to roleplay as a GM – although the PCs didn’t go back to her as much as I had hoped for. Third, the last three combats in Part III, particularly the ellicoth, were very good. But, like the first two parts, this part had some problems. In no particular order – first, there isn’t a word about what the PCs can find if they do an Eoxian planetary infosphere search on the Corpse Fleet or hubs of Corpse Fleet supporters in The Splice. Other than simply telling the PCs “you don’t find anything” no matter how high they roll (which is unsatisfying), the module offers no clues as to if/how connected the Corpse Fleet is online with recruiting potential supporters (which the PCs wanted to pose as to gain information). [spoiler] Second, the PCs managed to capture one of the three ghouls ransacking Gretal’s apartment in area F (pg. 27-28), but the scenario doesn’t give any information on what they know or how they know it regarding Gretal’s report to the Ministry of Eternal Vigilance. Is there a leak somewhere? Where? How were the ghouls contacted? By whom? Great questions my PCs asked that I had absolutely no answers to. Third, we know from pg. 21 that “Captain Vesh also stole synthetic flesh from the vats at Fleshworn Fabrications, left an obvious Corpse Fleet badge at the scene of the crime, and sprinkled some of Xerantha’s shed osteoderms into the empty vat for good measure.” But when the PCs go to area G to investigate the meat theft and ask to look at the security camera footage – the scenario makes no mention of any security cameras. The scenario does mention, on pg. 29, that PCs climbing the fence or flying into the facility causes “motion sensors (to) set off an alarm throughout the factory if anyone attempts to bypass the gates in this manner.” So how did Captain Vesh get in to steal the synthetic flesh and plant the evidence? It isn’t clear. And, lastly (and probably least), there’s no reason given why the PCs couldn’t buy or rent a flying vehicle (examples on pg. 229 of the core rulebook) to travel out to Xerantha’s place, which makes the final encounter a bit difficult. All in all, there’s a lot above that lists what’s wrong with this part of the AP. While most of my reviews of the SFS scenarios/Starfinder APs aren’t this negative, I felt like this one consistently missed the mark on explaining why things were the way they were or filling in very notable gaps that the PCs could be expected to take during their various investigations. Once everybody agreed to stay on the railroad tracks, not ask too many questions, and “go with it” my group still had a good time, but I was really hoping for more (and felt like I got more out of Parts 1 and 2 of the Dead Suns AP). Hoping for better things from Part 4. SO EXCITED that this is announced! We are going to the undead planet, folks (among other places). The levelling in Starfinder APs seems it will be a little slower than in PF ones. That, or Starfinder isn't a 20-level game. I think I read somewhere that it is. Erik (I think) said that they toyed with the idea of capping it lower, but eventually decided it wasn't worth the effort in changing such a fundamental assumption. EDIT: I'm not only paraphrasing but also extrapolating there with respect to the reasons behind the decision. I'm sure I read somewhere that the levels would go from 1-20 though. Well, the books are also shorter. They're just getting started up. Exactly. I think the progression is just slower because these adventures are shorter than Pathfinder APs. It sounds like part four might be our first trip out of the solar system! Excited to see how a long jaunt in the drift plays! Do you have an announcement providing the breakdown of pagecount somewhere you could point me to? How about the last sentence of the last paragraph in the product description above on this very page that says, "Each 64-page volume of the Starfinder Adventure Path also contains in-depth articles that detail and expand the Starfinder campaign setting and provide new rules, a host of exciting new monsters and alien races, a new planet to explore and starship to pilot, and more!" Ah, yeah. I told you I wasn't good at finding information! This chapter sounds like a TON of fun! Strange for there to be no official cover art so close to a release. It's a November release according to the store page. November pre-order just means that the order auths will run near the end of November. The PDF/street date will probably be around the middle of December. Updated with final image and description! Damn, that was worth the wait. Awesome art! Damn you for putting an "Ellicoth" on the cover! So, necrografts. Do you think they're just cybernetics/biotech with some flavor, or will they have some unique rules? Wasn't expecting a living eoxian, despite knowing they were in the game. Wow. interesting art. What're the player options available in the AP? Also, any chance of more specific animate dead rules? This is adventure module not a player book, so not much honestly. What it does have is necrocraft, elebrian stats and equipment/ships used by corpsefleet which could be looted/used/bought by players as well I suppose. What are living elebrians like? (I really want them to have racials that help them with necromancy or something similar). Well they have +2 con and int -2 wisdom, but otherwise they aren't necromantic species, just really knowledgeable one. They have ability to find weaknesses in creatures(as full action can do attack that adds half their level to damage once per creature) and can attempt knowledge skill checks untrained and take 20 in them with 2 minutes of time. So basically, 2 minutes and elebrians never need to google to find any information they want. I still have no idea what Ambassador Nor's package was about. Book still doesn't explain why he wanted "content" of the package smuggled, while I can understand that PCs don't know that, as GM I still wouldn't know at this point what the heck it is about. At this point I have no idea if the AP will ever explain it and once I have all six parts, it is annoying to have to check later books to confirm something for earlier books. Also, little bit annoyed by encounters were someone is mind controlled but no explanation is given what happens if pcs break the mind control or avoid killing the mind controlled guy :P Seriously, its annoying when book as written just assumes players kill someone under control or have no chance of noticing it. what Nor's plan with the package is? Not gonna lie, I think that's pretty frustrating, because I feel like that is something that should've been clear since book 1. RPing the guy without knowing his motivations is less than ideal. hes not allied with Corpsefleet(despite being his alignment) since he does help out PCs if he is still on good term with them, but beyond that? Yeah no clue at all. Heck I think its bit contradictory since Corpsefleet apparently did know about the package and it is mentioned in this book as well as point were they took notice of PCs. The soldier in the package is a deserter of the Corpse Fleet trying to get into Absalom Station to trade information for a new life, or something like that. The Corpse Fleet's aggressive attempts to retrieve her are in stark contrast with her own wishes, which to me confirms that her current actions go against the Fleet. they didn't smuggle the package. I agree wholeheartedly with Corvus Mask, I would expect my players to try to find out more about this during this part of the AP and knowing the truth would be really helpful for the GM. I have no idea what reason there is for not having revealed this piece of information yet. Hmm, I don't think anybody said anything really spoilery out of tags, but ok trying to remember that in future. If you don't want to be bothered with spoiler tags, take it to the GM reference threads. Criticism is fine, but if it involves the adventure or previous adventures it should be done with spoiler tags. Added some spoiler tags. For the product discussion thread, if its spelling out plot points, its probably better to use spoiler tags and be safe. Thanks. Who wants to tell poor boy (yours truly) about them critters in the alien archive? And that new planet would be nice to hear about to. As always, you have my gratitude. Could one of the developers (@Thurston Hillman or @John Compton etc) please answer if the above discussed spoiler from book 1 will be revealed in book 4, 5 or 6 and if yes in which one? If not, how would you handle the situation as a GM? 1. Which necrografts are in the book and what do they roughly do? 2. What are the additional Corpse Fleet starships (name, size & tier)? 3. What is the new starship on the inside covers? 4. Some details on the rogue planet that hosts a secret Corpse Fleet base? Aside from the playable elebrians, we get a gaggle of undead creatures (some expected, some exotic) that all come with template grafts, so you can convert any humanoid to them. We also get a couple more general monster-creatures that work well in many environments and have some interesting mind-control powers. The new planet, Barrow, is a rouge planet (does not orbit a star) out in the Vast with a huge Corpse Fleet base/shipyard. At one point they tried to put planet-sized thrusters on it, but they blew a chunk off by accident. Which necrografts are in the book and what do they roughly do? Necrografts are a new type of augmentation. There are some unique necrografts (I'll get to those in a bit), but the neatest thing about them is that you can get any cybernetic or biotech as a necrograft instead for just 90% of the cost. The catch? You pick up the necrograft subtype, which makes you vulnerable to spells and other effects that target undead. All the necrograft-only augmentations come in mk 1 - mk 5, which span item levels 1 - 20. They include things like environmental protection, hidden natural weapons, and the ability to inflict status conditions or diseases on enemies. There's some other neat stuff as well.